Cozy, Boutique Hotel with Beautiful On-site Garden with Waterfalls. 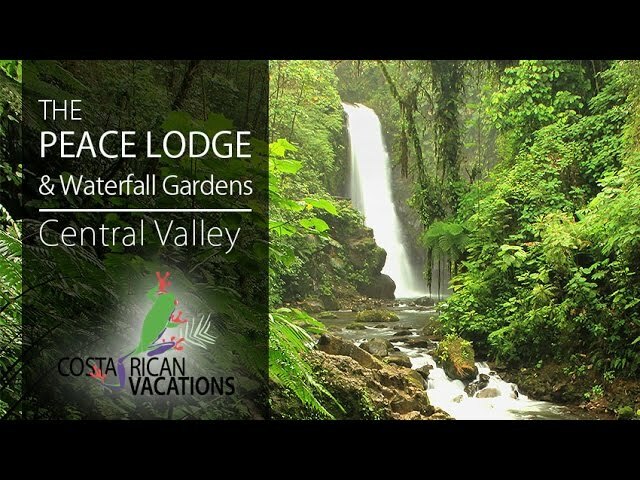 Located less than one hour from the San José Airport, the award-winning Peace Lodge is an ecological gem that makes a great first (or last) destination during your stay in Costa Rica. The property, home to the famous La Paz Waterfalls, showcases the various natural wonders that make up Costa Rica’s precious rainforests! The Peace Lodge is comprised of just 16 guestrooms and two villas. The rooms are elegantly designed with charming rustic touches of natural wood and stone. Each guest room comes with a Jacuzzi tub, stone fireplace, waterfall showers, satellite TV, safe deposit box, hair dryer, mini-fridge, and coffeemaker. Hotel amenities include complimentary WiFi in the rooms and lobby. They offer signature guided tours like their Waterfall Garden tour, nocturnal frog pond visit, and birdwatching. Guests can also opt to do self-guided tours. There are many restaurants on-site at The Peace Lodge, including the Colibríes Restaurant (buffet with kid-friendly cuisine), Big Trout Bar (a la carte tapas and bar service), and the Vista Poás Dining Room and neighboring Las Tucas Lounge. Guests have the choice of ordering breakfast to their rooms or dining on the outdoor patio overlooking the Poás Volcano. Enjoy the varied on-site attractions including the jungle cat sanctuary, monkey house, aviary, frog pond, and serpentarium. Explore the historical Costa Rican farmhouse—the Casita. Feed the hummingbirds in the evenings, go fishing at the trout lake, or just relax and take in the views of the La Paz River Valley and Poás Volcano. La Paz Waterfall Gardens is the #1 most visited privately owned ecological attraction in Costa Rica featuring the best hiking near San José, the most famous waterfalls in Costa Rica, and a rescued wildlife sanctuary with over 100 species of animals and an environmental education program. For a truly romantic evening, guests can enjoy views of the La Paz River valley and the Poás Volcano from the Jacuzzi tub on the balcony. Each room boasts a Jacuzzi tub and stone fireplace along with waterfall showers.